We’re pulling in quite a bit from our garden since it’s been getting so cold at night. We probably won’t be getting many more fresh tomatoes (sniff). 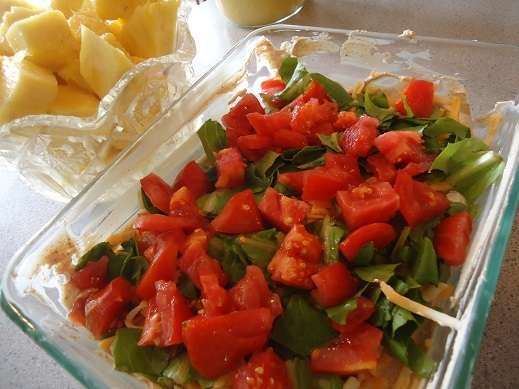 I chopped one up to go with a new recipe – Taco Dip. 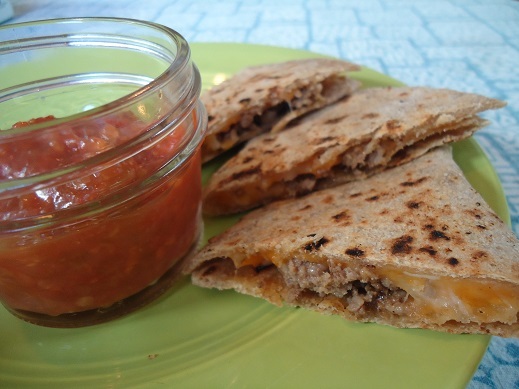 It was super, super easy and really delicious – two favorite qualities in a recipe at my house. Fresh pineapple (not from our garden, ha!) was a great side dish. And of course, I served a mountain of quesadillas too. We’re serious about our food. I’ve got a new Make-Ahead Lunch Box idea to share with you later this week. Below is a sneak preview. Simple and delicious. Full details coming in a few days! One of the cold days last week, you would have found me wearing my wool socks…and drinking an iced coffee. Silly and counterproductive, I know. 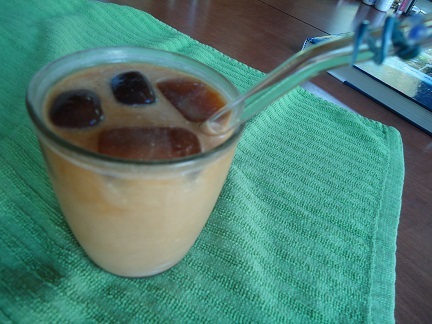 But the iced coffee was delicious, making the shivering episode completely worth it. I will say though, I stuck with hot coffee the rest of the week. I’m not completely crazy (just mostly). Tell me a little about what you’ve done the past few days. Hope you had a good week! Too funny that Taco Dip was a “New ” recipe for you:). It has been Wisconsin appetizer/potluck staple for years. Though my Mom’s side of the family always puts sliced black olives on top. I’m guessing by the picture you made the taco seasoning version. There is also a version using salsa. Either way it’s delicious! I went to the country living magazines craft fair in Columbus Ohio ~ it was amazing. ~ BIG ~ lots of amazing crafter’s from all over the USA. We watched a salvage book author create really nice things from nothing??? She was good. Lots of stationary, soap, honey, vintage old stuff. Pumpkins made from corn husks, sheets and blankets made in the u.s. that felt amazing! Artists, chairs upholstered in fun fabrics, jewelry made from old typewriter keys and coal miners tags. I could go on and on it was all great except the ladies rooms and the food? Hahaha! Thursday and Friday were major cooking and cleaning days. Yesterday the puppy graduated from training as a “good dog”, and I met some neighbors! Today is a beautiful day, the hubby is home, we enjoyed pancake breakfast as a family, and we have NO plans for Tuesday. Hurray! I made your cheeseburger soup for lunch today and am making your breakfast pizza for supper. I’m also in NE. I’ve been using the cold weather as a reason for baking cinnamon rolls, pizza, refried beans and enchilada casserole this weekend. We went apple picking, farmers market stands, and one day here in CO , we even made hot cocoa, 40 degrees prompts one to do so. We also made hot cocoa – first of the season! Fall has arrived here, too. I was blessed to attend our 5th Annual Ladies’ Retreat this weekend. It was such a blessed time. One thing I love about cold weather is the food… soups, breads, pumpkins, & apples. YUM! Well, I wouldn’t say it’s “cold” in our house yet, just “cool”. Kind of. I mean, it got a bit cooler with some rain this weekend. I opened some windows and our house temp got down to 75! Our a/c is set for 82 during the day, so this is my first time to turn the a/c off this fall! I’ve only ever lived in TX, so I can only imagine what it’s like up north!